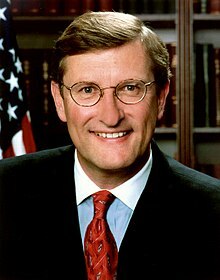 Gaylord Kent Conrad (born March 12, 1948) is a former American politician who was a United States Senator from North Dakota. He is a member of the North Dakota Democratic-NPL Party, the North Dakota affiliate of the Democratic Party. First elected to the Senate in 1986, he served as chairman or Ranking Member of the Senate Budget Committee for twelve years. On January 18, 2011, Conrad announced that he would not run for re-election in 2012, but would instead retire. Conrad said in a statement that it was more important that "I spend my time and energy trying to focus on solving the nation's budget woes than be distracted by another campaign." Fellow Democrat Heidi Heitkamp was elected to replace him. Conrad currently co-chairs the Bipartisan Policy Center's Commission on Retirement Security and Personal Savings. Conrad is also a member of the ReFormers Caucus of Issue One. Conrad was born in Bismarck, North Dakota, the son of Abigail and Gaylord E. Conrad. He lived much of his early life in Bismarck, in which he was orphaned at a young age and thus raised by his grandparents. His education saw him attending Roosevelt Elementary and Hughes Junior High, Wheelus Air Base high school in Tripoli, Libya, before eventually graduating from Phillips Exeter Academy. He then began attending college at Stanford, and received an M.B.A. from The George Washington University. Conrad has been married twice during his life. His first wife, Pam, is the sister of former U.S. Secretary of Agriculture and former North Dakota Governor Ed Schafer, with the marriage producing one daughter, Jessamyn. On Valentine's Day 1987, Conrad married Lucy Calautti, his 1986 Senate campaign manager who is currently a lobbyist for Major League Baseball. After graduating from college, he became a civil servant, working as an assistant to the North Dakota State Tax Commissioner, Byron Dorgan, who later became his colleague in the Senate. Conrad made his first entry into politics when he ran unsuccessfully for the North Dakota Auditor's office in 1976. In 1980, Conrad succeeded Dorgan as Tax Commissioner. Conrad was state tax commissioner until 1986, when he ran for the Senate. In April 2006, he was selected by Time as one of "America's 10 Best Senators". That same year, he was commended by The American for his knowledge of economic issues. Conrad endorsed Senator Barack Obama for the 2008 Democratic Presidential Race. Conrad was a leading member of the "Gang of 10", a conservative group which pushed for much greater offshore drilling in sensitive environmental areas. He was well known for using charts as visual aids when speaking in the Senate, which earned him the nickname "Godfather of Charts." In the 2009 negotiations over reforming America's healthcare system, Conrad strongly opposed any "public option." The AFL-CIO announced they would fund a primary challenge against Conrad in 2012 if he continued to oppose a "public option." On September 29, 2009, Senator Conrad voted with Senate Finance Committee Republicans against an amendment to a health care bill that would have provided for a public insurance option. He was supportive of the Stupak-Pitts Amendment, which places limits on taxpayer-funded abortions in the context of the November 2009 Affordable Health Care for America Act. Conrad is more politically conservative than most Democrats. He has voted consistently in favor of banning the partial-birth abortion medical procedure. He also opposes public funding of abortion. However, Conrad voted in favor of lifting the ban on abortions on military bases. Conrad has a mixed record on gay rights. While he personally is opposed to gay marriage, he voted against a proposed constitutional ban on the matter and has supported bills that prevent discrimination based on sexual orientation. On January 31, 2006, Conrad was one of four Democrats to vote in favor of confirming Judge Samuel Alito to the Supreme Court. A strong supporter of the Simpson-Bowles plan, Conrad, chairman of the Senate Budget Committee, announced on April 17, 2012 his plan to offer a version of that deficit-reduction proposal which he, as a member of the National Commission on Fiscal Responsibility and Reform, helped to develop. Lawmakers on the Senate Budget Committee could be forced to vote or modify the plan. Conrad is known as having a deep understanding of monetary policies and budget issues. He identifies as a "deficit hawk" because of supporting a balanced federal budget, although he continues to support farm subsidies. He has voted against Republican proposals to repeal the estate and alternative minimum taxes. He supports lowered middle-class taxes, but increasing taxes for persons making more than $1 million per year. In 2010 he supported extending the expiring Bush tax cuts "at least until the economy is clearly recovering." Conrad was very vocal in his opposition to the spending policies of the George W. Bush administration. He contends that Bush worsened the problems of national debt. Conrad is also opposed to most free-trade measures, and is a strong supporter of farming subsidies to family farmers. Conrad voted in 1991 against approving the use of military force in Iraq. He was one of only 23 senators to vote against the war resolution of 2002. While he initially voted in favor of the USA PATRIOT Act, he has opposed warrantless wiretapping and government's continued use of the Guantanamo Bay detention facility. In June 2008, it was reported that Senator Conrad had received mortgages on favorable terms for a second home and an apartment building due to his association with Countrywide Financial CEO Angelo R. Mozilo. Conrad acknowledged that he spoke with Angelo Mozilo, the Countrywide CEO, by phone. In an April 23, 2004, email about one of Senator Conrad's loans, Mozilo encouraged an employee to "make an exception due to the fact that the borrower is a senator." Conrad denied any prior knowledge of such treatment and gave away the mortgage discount to charity. Citizens for Responsibility and Ethics in Washington (CREW) called on the Senate Ethics Committee to investigate Conrad. In August 2009, after a year-long inquiry, the bipartisan Senate Ethics Committee exonerated Senator Conrad of any unethical behavior regarding his dealings with Countrywide Mortgage. In the 1986 election, Conrad defeated the Republican incumbent, Mark Andrews, by 2,120 votes. Andrews had represented North Dakota at the federal level since 1963 (he had previously served in the House before moving to the Senate in 1981). During the campaign, Conrad pledged that he would not stand for re-election if the federal budget deficit had not fallen substantially by the end of his term. By 1992 it became obvious that this would not be the case, and although polls showed that the electorate would have welcomed his reneging on that pledge, Conrad considered his promise binding and did not run for re-election. Byron Dorgan won the Democratic primary election. Despite North Dakota's Republican leanings, Conrad was comfortably re-elected in 1994 — a year when Republicans swept up most of the Congressional seats that were not in heavily Democratic-leaning parts of the U.S.
^ a b Mark Memmott (January 18, 2011). "Sen. Conrad, D-N.D., Won't Run In 2012". NPR. ^ "Kent Conrad, Co-Chair, Commission on Retirement Security and Personal Savings; Former Senator from North Dakota". Bipartisan Policy Center. ^ "ReFormers Caucus Members". Reformers. ^ "(Gaylord) Kent Conrad". Ancestry.com. Retrieved January 2, 2012. ^ "Statement from Senator Kent Conrad on Death of Moammar Gadhafi" (Press release). October 20, 2011. Archived from the original on 2012-04-11. Retrieved 2012-11-07. ^ "Meet the nominee for Secretary of Agriculture". High Plains/Midwest Ag Journal. November 2007. Archived from the original on 2011-07-12. ^ Jerry Hagstrom; Keith Koffler (October 31, 2007). "Bush nominates former North Dakota governor as Agriculture secretary". Government Executive. ^ Jelsing, Catherine (Fall 2002). "For the Love of the Game". NDSU Magazine. Archived from the original on January 5, 2013. Retrieved January 2, 2012. ^ Sarah Kliff (7 February 2013). "Here's what happens when you move into Kent Conrad's Senate office". The Washington Post Wonkblog. ^ Jonathan Allen; Carrie Budoff Brown (November 9, 2009). "Senate faces abortion rights rift". Politico. ^ "Kent Conrad on Abortion". OnTheIssues. ^ Roll Call Vote 109th Congress - 2nd Session (on the confirmation of Samuel Alito of New Jersey) Archived 2017-03-21 at the Wayback Machine, United States Senate, January 31, 2006. Retrieved November 26, 2018. ^ Kirkpatrick, David D. (1 February 2006). "Alito Sworn In as Justice After Senate Gives Approval". The New York Times. Retrieved 26 November 2018. ^ Ezra Klein (April 18, 2012). "Can Simpson-Bowles really pass the Senate?]". The Washington Post blogs. ^ "Senator Kent Conrad | North Dakota". Conrad.senate.gov. Archived from the original on 2010-10-02. Retrieved 2010-08-29. ^ Kim Dixon (July 22, 2010). "Divisions among Dems over tax cuts for affluent". Reuters. ^ a b "Countrywide's Many 'Friends'". Conde Nast Portfolio. June 12, 2008. Archived from the original on June 19, 2008. Retrieved June 21, 2008. ^ a b Editorial (June 22, 2008). "With Friends Like Angelo ..." The New York Times. ^ Fritze, John (August 7, 2009). "Dodd, Conrad cleared after ethics probe". USA Today. Retrieved January 2, 2012. This page was last edited on 11 March 2019, at 22:50 (UTC).